In actual fact the dismantling of the ISDN network is already underway. 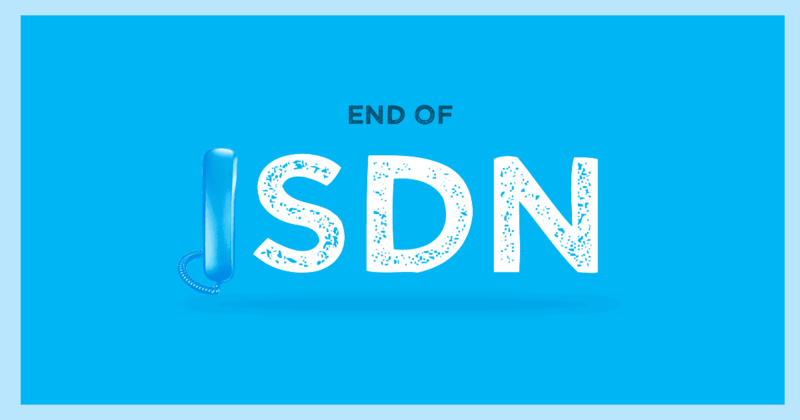 Telstra stopped selling new ISDN services to new users at the start of 2018, and then in June ceased sale of new ISDN lines altogether. The countdown is now on until enforced disconnections start on 30 September 2019. 31 January 2018 No New ISDN services If you didn't already have ISDN services, you were no longer able to purchase an ISDN service. 2022 No further support Telstra will stop supporting all ISDN2, ISDN2 Enhanced, ISDN10/20/30, DDS Fastway, Megalink and Frame Relay services. Telstra announced recently that the following products will no longer be sold and will be disconnected entirely by 2022: The first enforced disconnections will start in September 2019. ISDN lines are going. For some premises this will occur in a matter of months. For others, the enforced disconnection date could be further away with the entire network shutdown by 2022. VoicePlus is advising customers to prepare for the shutdown of ISDN well before the predicted disconnection date in their area. In most cases, it makes sense to replace ISDN lines when the premises becomes nbn-ready, and at the same time as migrating any PSTN lines to nbn. This ensures your business does not get caught in the bottleneck that is coming due to many premises leaving their transition until the last minute. It also minimises the chance of disruption or downtime to your business. Lean on your telephony partner to discuss the options for your migration, any hardware that might require upgrading, the pricing and the timeframes involved. If you don't have a partner, contact VoicePlus for assistance. SIP presents an opportunity to revolutionise your communications with a more flexible, scalable technology that offers immediate benefits. Track record: Can your potential SIP provider provide case studies of successful implementations of a similar service for businesses of a comparable size? Pricing: A SIP migration pricing model will include a one-off installation and hardware charge, combined with a monthly network service fee. Additional features like 100-range numbers and ??? will attract additional fees. For those of you that don’t speak 'telco', below is a non-technical description of the three technologies. PSTN is the same phone line most people have at home, that sends voice data over copper phone lines, and while things may have changed over the years, PSTN is a very, very old technology, dating back to the first telephone networks of the late 19th Century. ISDN, on the other hand, has only been around since the 1980’s so, by comparison, is relatively young. ISDN is used for voice and data services which can be delivered simultaneously on digital lines. When launched, ISDN technology was applauded for supporting video conferencing and giving the fastest possible internet connections, up to a then blistering 128 kbps! Now of course there are other, more advanced (and faster) technologies that can provide these sorts of services so the unique selling points for ISDN are now no longer unique. Cheaper and more efficient solutions include VOIP (Voice over Internet Protocol) for your voice calls, and/or SIP (Session Initiated Protocol) for combined internet and voice. The good news is that SIP comes with benefits of greater speed, versatility and portability, which is why telco firms around the world are leading the switch.